Rudi van der Zwaal presents a pilot report on the Embraer Phenom 300, which he flew when it visited New Zealand on a demonstration tour recently. 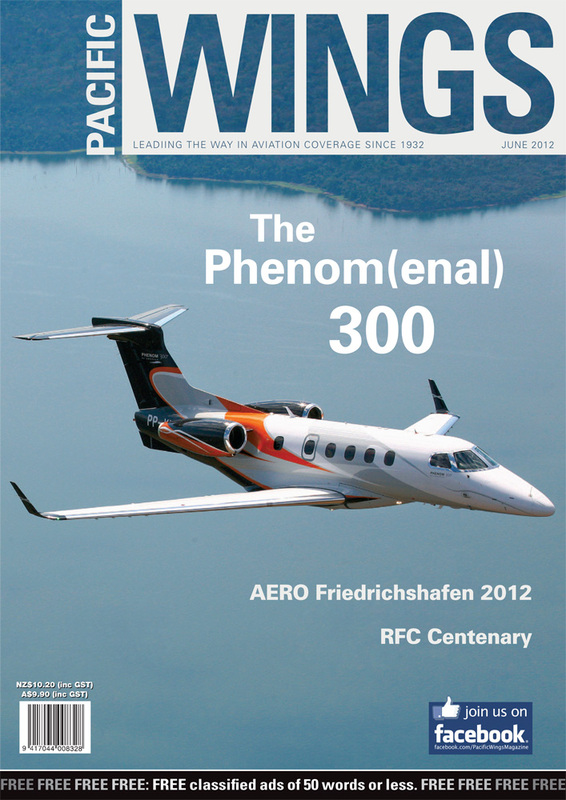 Mike Friend recently visited AERO 2012 at Friedrichshafen in Germany—the expo and show that describes itself as “the global show for general aviation”. Part three of a five-part series of articles. Christine Ody continues her series of articles on what it takes to become an Air New Zealand pilot. The 1st of April this year marked the centenary of the formation of the Royal Flying Corps (RFC), which gave rise soon afterwards to the Royal Air Force. Peter Cooper was at Farnborough to witness the event. Kevin Henderson, NZALPA’s IFALPA Director and Globalisation Coordinator, presents a pilot’s perspective of the recent Qantas groundings. Paul Sortehaug continues his series of articles on New Zealand’s air aces with the story of Wing Commander Andrew William Barr.